« Christmas and New Year Greetings from the Raptor Politics Team. The RSPB Scotland is currently at the centre of a courtroom legal battle over secret filming on an Aberdeenshire estate without the landowner’s knowledge or permission. If the sheriff rules the video as admissible the evidence could result in the successful prosecution of a gamekeeper. A Scottish sheriff has been urged to allow the use of covert video footage as evidence in the trial of a gamekeeper accused of killing or injuring protected birds of prey, including goshawks and buzzards. George Mutch found guilty today at Aberdeen Sheriff’s court of various wildlife offences. Mr Mutch has now had his membership of the Scottish Gamekeepers Association withdrawn. The Crown wants to use the footage as evidence in the trial of George Mutch, who is accused of killing or injuring the birds on the Kildrummy Estate in Strathdon. The 48-year-old is alleged to have recklessly killed or injured two goshawks and a buzzard by using bird traps between August 6 and September 13, 2012. He denies all the charges against him. Without the RSPB video evidence the charges could be dismissed by the court, as demonstrated by a number of similar prosecutions against gamekeepers undertaken by Scottish courts. The case at Aberdeen Sheriff Court has now been put on hold until the sheriff rules over the admissibility of footage obtained by RSPB officers after they hid a camcorder on the estate. Mr Mutch’s defence advocate, Mark Moir, argued that the footage is inadmissible and cannot be used in the trial against his client. He claims that the RSPB has an agenda against the use of controversial crow traps – and used the camcorder in an attempt to seek out evidence of criminality. Mr Moir suggested that the RSPB was using the covert methods to “obtain convictions”. However, specialist wildlife crime fiscal depute, Tom Dysart, yesterday summed up the evidence from RSPB officers which had been heard during the two day hearing. He urged Sheriff Noel McPartlin to allow the footage. Where video evidence has been brought before the court in Scotland on previous occasions the sheriff as ruled such evidence was inadmissible. Mr Dysart said: “Whatever the RSPB can do, and what they are requested to do, is not relevant – other than how it may reflect on their good faith. “The purpose for the RSPB being on the land was not unlawful. They were there to carry out research and I urge you to accept their evidence on that basis. The ‘trial within a trial’ hearing started on Monday, with various RSPB representatives giving evidence as to the gathering and use of the footage. Sheriff McPartlin is expected to make a ruling on the use of the video evidence in the trial today. Update on this story since being published. Mr Mutch was found guilty of killing two goshawks and one buzzard and setting traps illegally to capture two others on an Aberdeenshire estate. George Mutch, 48, of Kildrummy, was accused of recklessly killing or injuring a goshawk and illegally taking away another goshawk and a buzzard in 2012. Mutch was found guilty of four charges at Aberdeen Sheriff Court today after the video evidence was admitted by the sheriff. In what may turn out to be a landmark prosecution, Sheriff Noel McPartlin said he would consider a custodial sentence. It is one of the first times in Scotland that hidden camera footage, obtained by the RSPB, had been used in a case of this kind. Mutch will be sentenced next month. 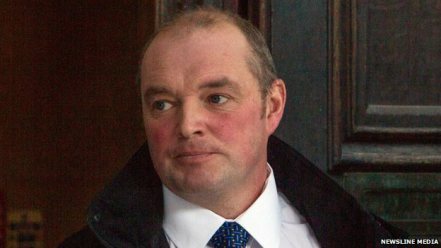 2 comments to Defence advocate urged Scottish Sheriff not to allow video footage which could lead to the successful prosecution of Gamekeeper. Interesting to note at a meeting to encourage policeman to become wildlife crime officers a local man I know noticed that majority of the policemen present were involved with shooting. This would mean in the future any removal of birds of prey from shooting estates would not be seen as a crime if this majority got the jobs! !